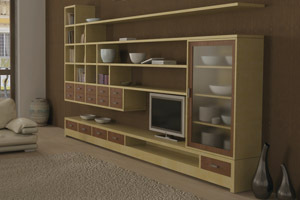 The cabinet is complete of lcd screen, dishes, glasses, books, vases, dvds, and everythings you can see in the thumbnail. This TV stand features a handsome wood finish for a sophisticated appearance. Four drawers provide concealed storage. The cabinet is complete of lcd screen, dishes, glasses, books, vases, dvds, and everythings you can see in the thumbnail. Ready for maya 2009 or successive.